"We are very pleased with our year-to-date earnings performance which was driven by strong performance from our core businesses," said Mike Renna, president and chief executive officer of SJI. "Results in our marketing and fuel management businesses coupled with the record utility performance produced economic earnings through the first six months of 2018 that exceeds all of 2017." "This quarter was also marked by several historic milestones tied to our business transformation efforts including the closing of the Elizabethtown Gas and Elkton Gas acquisitions and the inking of an agreement to optimize the value of our solar assets" Renna added. "These actions demonstrate that we are executing on the strategy we laid out in 2015 to refocus our business to emphasize high-quality, regulated earnings growth and increase the visibility and stability of earnings. We look forward to sharing additional details surrounding our growth plan at our upcoming Investor Conference." 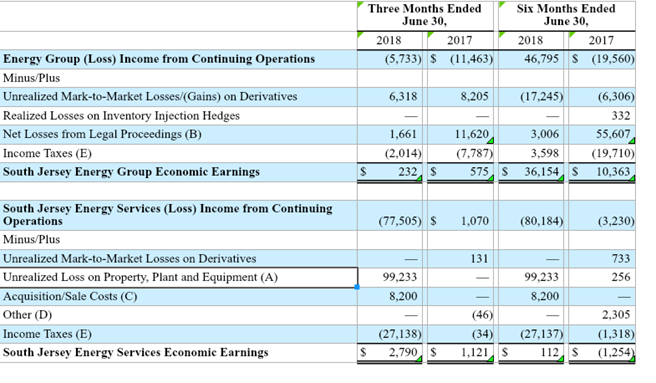 Consolidated GAAP income from continuing operations for the three months ended June 30, 2018 was a loss of $93.8 million ($1.12 per diluted share) compared to a loss of $7.6 million ($0.10 per share) in the prior year period. GAAP results include an after-tax impairment loss of $74.2 million related to the sale of our solar assets, which is described in greater detail in our 10-Q for the period ended June 30, 2018. SJI uses the non-GAAP measure of Economic Earnings when discussing results. We believe this presentation provides clarity into the continuing income of our business. A full explanation and reconciliation of economic earnings is provided under "Explanation and Reconciliation of Non-GAAP Financial Measures." Our gas utility segment for the quarter ended June 30, 2018 included the gas distribution operations of South Jersey Gas (SJG). On July 1, 2018, we completed the acquisitions of Elizabethtown Gas (ETG) and Elkton Gas (Elkton). Our utility segment will include the operations of these entities beginning in the third quarter ending September 30, 2018. 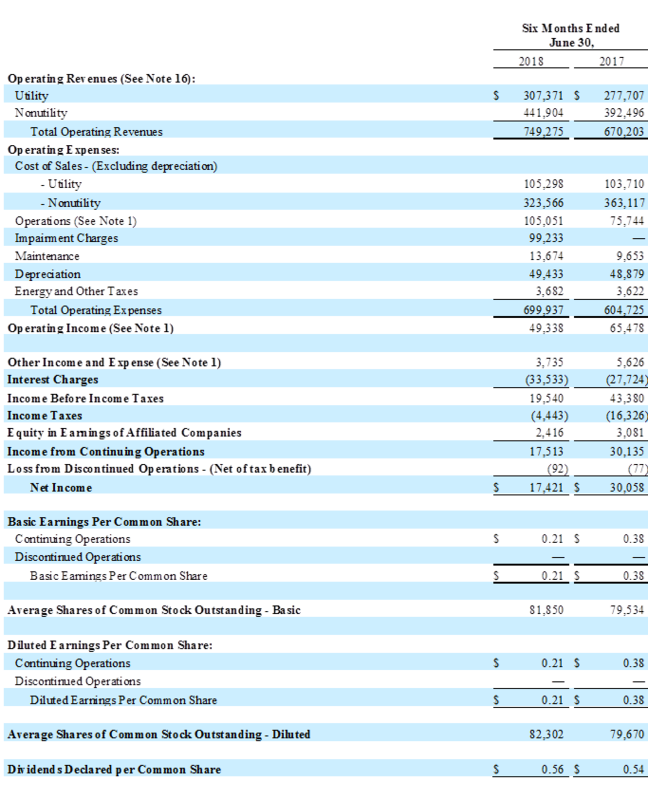 GAAP income from continuing operations and economic earnings are the same for SJG. Second quarter 2018 earnings were $1.6 million ($0.02 per share) compared with $2.3 million ($0.03 per share) in the prior year. The modest quarterly decline reflects higher operating costs partially offset by higher utility margin. We define utility margin, a non-GAAP measure, as natural gas revenues less natural gas costs, regulatory rider expenses and related volumetric and revenue-based energy taxes. Utility margin increased $4.0 million compared with last year driven by our base rate case settlement, the roll-in of investments for infrastructure replacement and improvement and customer growth partially offset by a reduction in customer billings as a result of the Tax Cuts and Jobs Act. Utility operating costs increased $4.8 million compared with last year, largely reflecting higher operating & maintenance expense tied to increases in personnel, governance, compliance and system maintenance. These investments are primarily aimed at improving efficiency and productivity for the benefit of our customers. Higher depreciation expense reflects capital investment in infrastructure and customer growth. South Jersey Gas added more than 8,700 new customers over the last 12 months and now serves more than 385,000 customers. Our 1.6% growth rate compares favorably to our peers and has largely been driven by gas conversions (~70% of new customer additions) from alternate fuels such as oil and propane. We continue to estimate an additional 50,000 customers currently served by higher-priced alternate fuels are located very near our system, implying solid potential for conversion activity in the future. We remain committed to improving our distribution system for the benefit of customers. Through infrastructure replacement programs, we are able to enhance the safety and reliability of our system while earning our authorized utility return on approved investments in a timely manner. Since 2009, we have invested $360 million to replace more than 600 miles of bare steel and cast-iron main under these programs. Our current Accelerated Infrastructure Replacement Program (AIRP II) authorizes an investment of $302.5M from 2016-2021 for a continuation of important infrastructure replacement upgrades. We expect to have replaced all bare steel and cast-iron mains within SJGs service territory by the end of the current program. Year-to-date, we have spent $27 million on AIRP II, on track with our targeted investment of approximately $60 to $65 million annually under this program. In November 2017, we filed for an extension of our Storm Hardening and Reliability Program (SHARP) with the New Jersey Board of Public Utilities (NJBPU). Our original $103.5 million program allowed us to replace 92 miles of coastal infrastructure to protect against future storm activity. In May 2018, the NJBPU reauthorized this program (SHARP II), allowing for an additional investment of $100 million through 2021 for four projects designed to enhance the safety, redundancy and resiliency of the distribution system along our coastal communities. We expect to invest approximately $20 to $25 million annually under this program. The Midstream segment is comprised of our 20% equity investment in the PennEast Pipeline (PennEast). PennEast is a planned $1B+, 1 Bcf, 120-mile interstate pipeline running from the Marcellus region of Pennsylvania into New Jersey. GAAP income from continuing operations and economic earnings are the same for Midstream. Second quarter 2018 earnings were $0.9 million ($0.01 per share) compared with $0.4 million ($0.01 per share) in the prior year, reflecting Allowance for Funds Used During Construction (AFUDC) related to the project. We continue to work with our PennEast partners as this critical infrastructure project moves through the state-level permitting processes. At this point, we are working through the details of gaining access to remaining land parcels along the route in order to confirm field-level environmental data for our permits. We will update the project timeline once we have clarity on completion dates for our state-level permitting; however, we do expect to commence construction on the project in late 2019. The Energy Group segment includes our non-regulated operations engaged in fuel supply management services and wholesale and retail gas and electric commodity marketing. Second quarter 2018 GAAP earnings were a loss of $5.7 million ($0.07 per share), an improvement compared with a loss of $11.5 million ($0.14 per share) in the prior year. Second quarter 2018 economic earnings were $0.2 million ($0.00 per share) compared with $0.6 million ($0.01 per share) in the prior year. Fuel management activities contributed economic earnings of $1.4 million ($0.02 per share) compared with $1.3 million ($0.02 per share) the prior year driven by a larger portfolio of contracts (six) compared with last year (five). With the Lackawanna facility coming on line in late June, we are now managing the fuel supply activities for seven facilities with two more expected to begin operations in the third quarter, providing low-risk earnings growth from this business line. Our wholesale commodity marketing business generated a loss in economic earnings of $0.6 million ($0.01 per share), an improvement compared with a loss of $1.1 million ($0.01 per share) last year, driven by lower operating costs. Our retail gas and electric commodity marketing business contributed a loss in economic earnings for the latest period of $0.6 million ($0.01 per share) compared with economic earnings of $0.4 million ($0.00 per share) last year. The Energy Services segment consists of our energy production portfolio including solar, combined heat and power (CHP) and landfill gas-to-electric assets. Second quarter 2018 GAAP results were a loss of $77.5 million ($0.92 per share) including the previously mentioned impairment loss, compared with earnings of $1.1 million ($0.01 per share) in the prior year. Second quarter 2018 economic earnings were $2.8 million ($0.03 per share) compared with $1.1 million ($0.01 per share) the prior year, with the improvement driven by Solar ($0.6 million) and CHP ($0.6 million). On June 28, we announced the sale of our solar assets to an entity managed by Goldman Sachs Asset Management. As the total purchase price for the assets was less than the total carrying amount, SJI recognized a $74.2 million, after-tax GAAP impairment loss in the latest period, which was excluded from economic earnings. When concluded, the ultimate net impairment loss from the sale is expected to be approximately $61 million, after-tax. Please refer to our 10-Q for additional details. Consolidated GAAP income for the six months year-to-date (YTD) ended June 30, 2018 was $17.5 million ($0.21 per diluted share) compared to $30.1 million ($0.38 per share) in the prior year period. GAAP results include an after-tax impairment loss of $74.2 million related to the sale of our solar assets and $26.5 million after-tax transaction costs related to ETG ($20.4 million) and Solar ($6.1 million). Economic earnings for the six months YTD were $105.9 million ($1.29 per share), an improvement from $62.0 million ($0.78 per share) last year, reflecting higher earnings at South Jersey Gas, Energy Group and Energy Services. YTD 2018 earnings were $68.3 million ($0.83 per share) compared with $48.7 million ($0.61 per share) in the prior year. Improved results primarily reflect increased utility margin of $19.5 million and decreased income tax expense of $11.9 million offset in part by increased operating costs of $14.6 million, driven by the same factors as the second quarter. Tax Reform had the impact of reducing both utility margin and income tax expense by $15.7 million in 2018 YTD. YTD 2018 earnings were $1.2 million ($0.02 per share) compared to $2.4 million ($0.03 per share) in the prior year. Higher results for the year ago period reflected a catch-up of AFUDC related to prior periods that had not been deemed appropriate to record until original receipt of FERC approval. 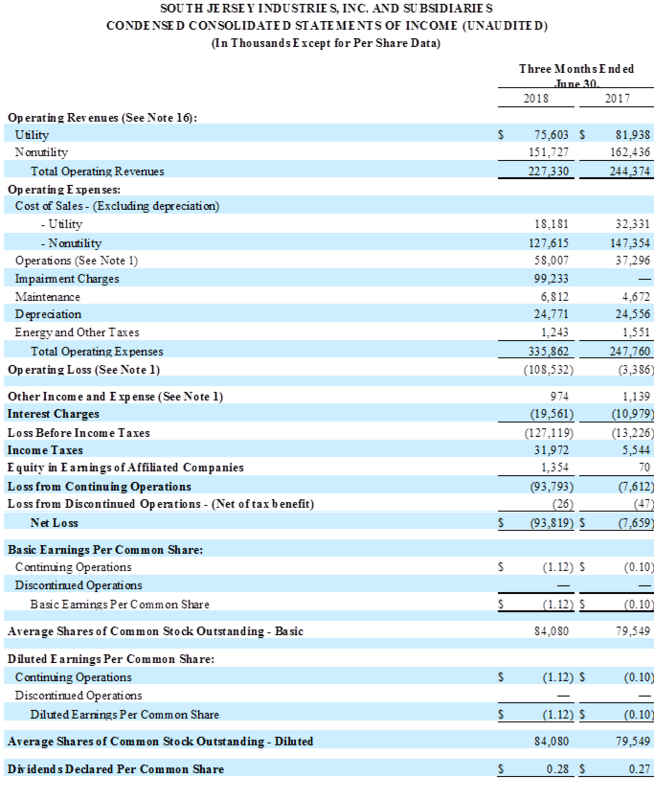 YTD 2018 GAAP earnings were $46.8 million ($0.57 per share) compared with a loss of $19.6 million ($0.24 per share) in the prior year. YTD 2018 economic earnings were $36.2 million ($0.44 per share), up from $10.4 million ($0.13 per share) in the prior year. YTD 2018 earnings primarily reflect strong performance from our wholesale business of $32.6 million ($0.40 per share) compared to $6.6 million ($0.08 per share) the prior year, driven by portfolio optimization and higher spreads experienced this past winter as compared to Q1'17 and the impact of federal tax reform. Fuel management activities contributed YTD 2018 economic earnings of $4.2 million ($0.05 per share) compared with $2.7 million ($0.03 per share) the prior year driven by a larger portfolio of contracts (six) compared with last year (five). As previously discussed, we are now serving seven facilities with two more expected to begin operation in the third quarter and two more by the end of 2020. Retail gas and electric marketing activities contributed a loss in economic earnings YTD of $0.8 million ($0.01 per share) compared with $1.0 million ($0.01 per share) last year. 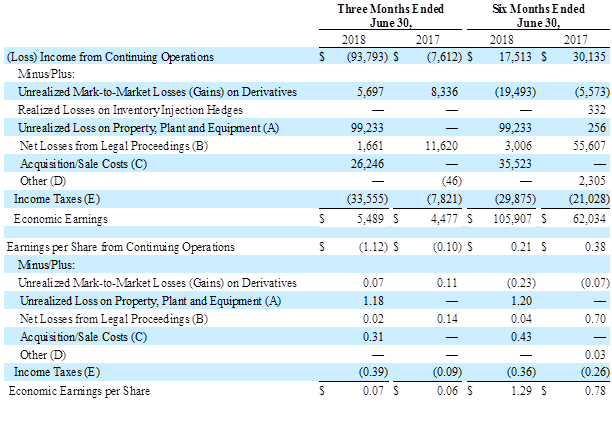 YTD 2018 GAAP results were a loss of $80.2 million ($0.97 per share) including the previously mentioned impairment loss, compared with a loss of $3.2 million ($0.04 per share) in the prior year. YTD 2018 economic earnings were $0.1 million ($0.00 per share) compared with a loss of $1.3 million ($0.01 per share) the prior year. Improved results versus last year largely reflect solar and CHP activities partially offset by increased operating costs and interest expense. In 2015, we began a planned shift in our future operating strategy toward a more regulated business mix. Our plan was driven by a desire to improve the quality of our earnings by increasing investment in utility and FERC-regulated assets that provide highly-visible cash flows and earnings while at the same time reducing our earnings volatility and optimizing the value of our non-core, non-regulated businesses. We have made significant progress toward implementing our plan since that time. In 2016, we announced a cessation of new investment in solar projects, reduced our portfolio of on-site energy production businesses, and significantly strengthened our balance sheet through a successful equity offering. In 2017, we announced plans to acquire ETG and Elkton, assets ideally tailored to our strategy. In 2018, we completed the acquisitions, including a successful equity offering, and announced the sale of our solar portfolio. We continue to explore strategic opportunities regarding our remaining non-regulated businesses that are not core to our strategic plan. We expect to communicate additional progress on this process in the coming months. On July 1, we closed on our acquisitions of Elizabethtown Gas and Elkton Gas from Southern Company (SO). These transactions involve assets we know well, improves our business risk profile, leverages our strong regulatory relationships in New Jersey, and provides an opportunity for enhanced utility investment via replacement of aging infrastructure. As part of the regulatory approval process, SJI agreed post-closing to begin discussions with NJBPU Staff and Rate Counsel on the replacement of ETG's cast iron, bare steel, iron and copper mains. Within six months of the start of discussions, SJI agreed to develop a plan to address these issues. We expect to leverage our experience at SJG when designing accelerated replacement plans for Elizabethtown. Upon closing of the acquisitions, SJI's non-regulated wholesale marketing subsidiary, SJ Resources Group (SJRG), became the sole asset manager for ETG and Elkton's gas supply requirements. Previously, this function was provided by Sequent Energy Management, a wholly-owned subsidiary of Southern Company (SO). As approved by the NJBPU, SJRGs asset management agreement extends from July 2018 through March 2022. Under the agreement, we expect to provide low-cost gas supply to ETG and Elkton customers while generating earnings for SJRG based on market conditions. In June, SJI entered into an agreement to sell its portfolio of solar energy projects to an entity managed by Goldman Sachs Asset Management (GSAM) for approximately $350 million in cash. The projects, located at 143 sites across New Jersey, Maryland, Massachusetts and Vermont, provide power to schools, hospitals, and commercial and industrial facilities. Under the terms of the agreement, SJI received $62.5 million of the purchase price in July, with the balance to be received over the next several months as individual projects in the portfolio satisfy closing conditions. SJI expects nearly all projects in the portfolio will satisfy their closing conditions prior to December 31, 2018. In July, S&P lowered SJI's and SJG's rating one notch to BBB with a stable outlook driven by increased leverage tied to acquisition debt. Post-closing, S&P expects a strengthening over time of financial metrics driven by our focus on regulated operations, ongoing regulatory recovery of infrastructure replacement costs at Elizabethtown Gas and expected divestment of a portion of our non-regulated operations. SJI is committed to a strong capital structure with ample liquidity and a solid investment grade rating. Accordingly, and as discussed in prior releases, we are evaluating optimal deployment of the anticipated proceeds from the sale of our solar portfolio and any other assets that may be sold. Among many options, we are considering potential repayment of outstanding indebtedness and potential reduced share issuance under our existing forward equity agreement. Our forward equity agreement was structured to allow flexibility for SJI to receive up to $200 million, at our option, in the future. At June 30, 2018, equity-to-total capitalization was 29.5 percent compared with 43.8 percent at December 31, 2017, reflecting acquisition-related financing activity. The acquisition-related cash was held in a restricted account as of June 30, 2018 in anticipation of the closing of the transaction on July 1, 2018. 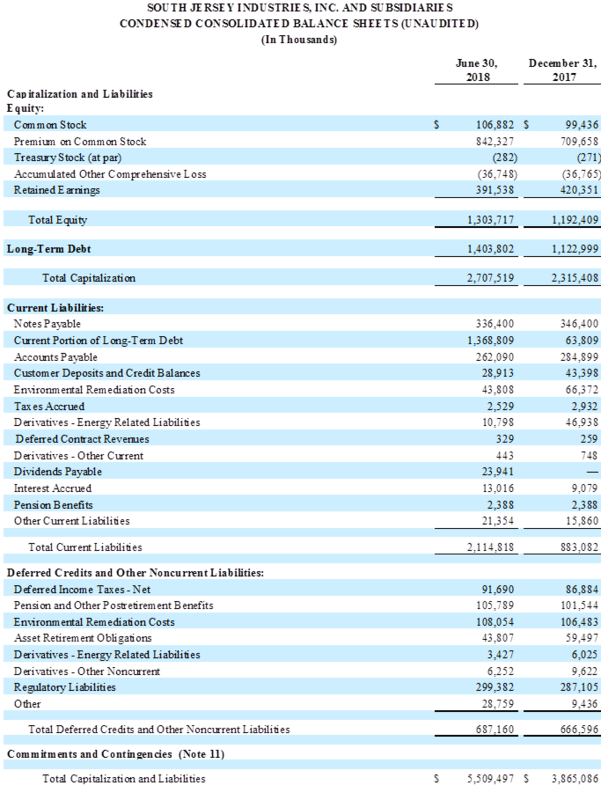 For the six months ended June 30, 2018, net cash from operating activities was $152.8 million compared to $123.7 million in the prior year period, largely reflecting strong operating performance at Energy Group earlier in the year. Net cash used in investing activities was $131.9 million compared with $162.9 million in the prior year period, reflecting timing of utility infrastructure upgrades and investment to support customer growth. 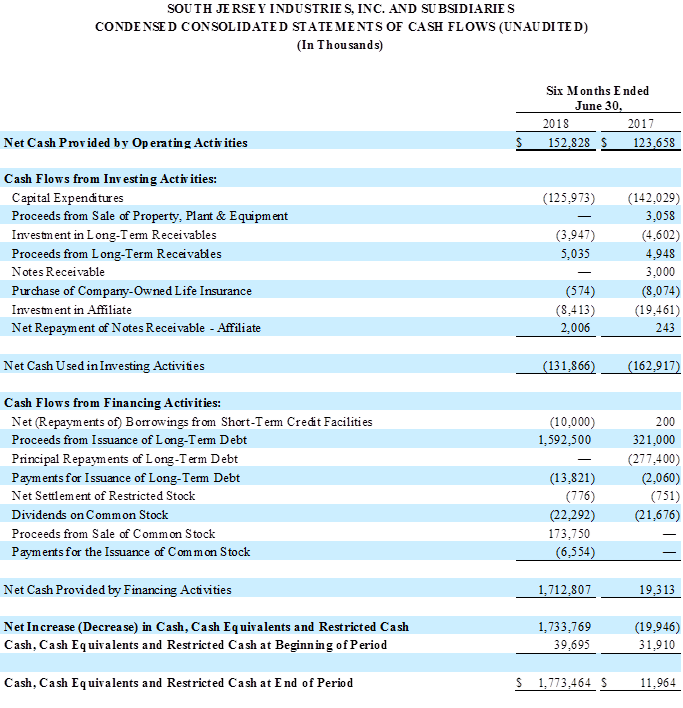 Net cash provided by financing activities was $1.71 billion compared to $19.3 million in the prior year period, reflecting acquisition-related debt and equity financing. On July 5, the SJI board of directors declared a quarterly common stock dividend of $0.28 per share, payable October 2, 2018, to shareholders of record on September 10, 2018. We have continuously paid a cash dividend since 1950 and increased the annual dividend each year since 1999. Our targeted payout remains 55 to 70 percent of economic earnings. We are reaffirming our previous 2018 economic earnings guidance of $1.57 to $1.65 per fully-diluted share for SJI, excluding impacts of acquisitions and divestitures. This range reflects our strong performance in the first half of 2018, including improved results from both our gas utility and non-regulated wholesale marketing and fuel management operations earlier this year. We continue to expect that our regulated businesses (SJG and Midstream) will provide 65 to 72 percent of 2018 economic earnings for SJI, excluding impacts of acquisitions and divestitures. Our guidance is subject to the risks and uncertainties identified below under "Forward-Looking Statements." We previously provided 2020 economic earnings guidance of $160 million. With the closing of our acquisitions of ETG and Elkton, and the sale of our solar assets, we expect to provide a detailed review of our combined company growth outlook by business segment and provide updated economic earnings guidance at our upcoming Investor Conference. Conference details, including agenda for the day and reservation instructions, will be provided in the coming weeks. SJI will host a conference call and webcast on Thursday, August 9 to discuss its second quarter 2018 financial results. To access the call, please dial the applicable number approximately 5-10 minutes prior to the start time. The call will also be webcast in a listen-only format for the media and general public. The webcast can be accessed at www.sjindustries.com under Events & Presentations. A replay of the webcast will be available on our website at www.sjindustries.com under Events & Presentations. SJI (NYSE: SJI), an energy services holding company based in Folsom, NJ, delivers safe, reliable, affordable natural gas service to approximately 681,000 customers in New Jersey and Maryland through its three regulated natural gas utilities: South Jersey Gas, Elizabethtown Gas and Elkton Gas. SJI's non-utility businesses within South Jersey Energy Solutions promote efficiency, clean technology and renewable energy by providing customized wholesale commodity marketing and fuel management services; acquiring and marketing natural gas and electricity for retail customers; and owning and operating on-site energy production facilities. 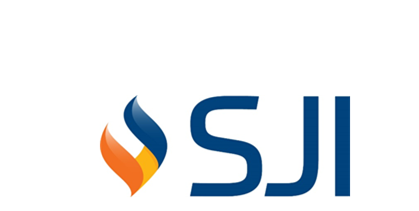 SJI Midstream houses the company's interest in the PennEast Pipeline Project. Visit http://www.sjindustries.com for more information about SJI and its subsidiaries. This news release contains "forward-looking statements" within the meaning of the U.S. Private Securities Litigation Reform Act of 1995. All statements other than statements of historical fact, including statements regarding future results of operations or financial position, expected sources of incremental margin, strategy, financing needs, future capital expenditures and the outcome or effect of ongoing litigation, are forward-looking. We use words such as "anticipate," "believe," "expect," "estimate," "forecast," "goal," "intend," "objective," "plan," "project," "seek," "strategy," "target", "will" and similar expressions to identify forward-looking statements. These forward-looking statements are based on the beliefs and assumptions of management at the time that these statements were made and are inherently uncertain. Forward-looking statements are subject to risks and uncertainties that could cause actual results to differ materially from those expressed or implied in the forward-looking statements. These risks and uncertainties include, but are not limited to, general economic conditions on an international, national, state and local level; weather conditions in SJI's marketing areas; changes in commodity costs; changes in the availability of natural gas; "non-routine" or "extraordinary" disruptions in SJI's distribution system; regulatory, legislative and court decisions; competition; the availability and cost of capital; costs and effects of legal proceedings and environmental liabilities; the failure of customers, suppliers or business partners to fulfill their contractual obligations; and changes in business strategies and the uncertainties that the anticipated acquisitions will be completed or that they will provide the benefits we anticipate. A discussion of these and other risks and uncertainties that could cause actual results to differ materially from those expressed in the forward-looking statements are described in greater detail in the Form 10-Q for the period ended June 30, 2018 and in other filings made by us with the Securities and Exchange Commission (SEC). These cautionary statements should not be construed by you to be exhaustive and they speak only as of the date they are made. No assurance can be given that any goal or plan set forth in any forward-looking statement can or will be achieved, and readers are cautioned not to place undue reliance on such statements, which speak only as of the date they are made. SJI undertakes no obligation to revise or update any forward-looking statements, whether as a result of new information, future events or otherwise, except as required by law. Management uses the non-generally accepted accounting principles (non-GAAP) financial measures of Economic Earnings and Economic Earnings per share when evaluating its results of operations. These non-GAAP financial measures should not be considered as an alternative to GAAP measures, such as net income, operating income, earnings per share from continuing operations or any other GAAP measure of liquidity or financial performance. For the three and six months ended June 30, 2018, Economic Earnings excludes approximately $99.2 million (pre-tax) of impairment charges recorded on solar generating facilities, which was primarily driven by the purchase price in the agreement to sell solar assets being less than the carrying amount of the assets. For the three and six months ended June 30, 2018, Economic Earnings excludes various costs related to the agreement to acquire the assets of Elizabethtown Gas and Elkton Gas, along with various costs related to a series of agreements whereby Marina will sell its portfolio of solar energy assets to a third-party buyer. For the three and six months ended June 30, 2017, Economic Earnings excludes the impact of a May 2017 jury verdict stemming from a pricing dispute with a gas supplier over costs, including interest charges and legal fees incurred, along with the realized difference in the market value of the commodity (including financial hedges). Economic Earnings also excludes the impact of a 2017 settlement of a legal claim stemming from a dispute related to a three-year capacity management contract with a counterparty, including legal fees incurred. For the six months ended June 30, 2017, Economic Earnings excludes an approximately $2.4 million pre-tax loss related to a new interest rate derivative and amendments made to an existing interest rate derivative linked to unrealized losses previously recorded in Accumulated Other Comprehensive Loss (AOCL). SJI reclassified this amount from AOCL to Interest Charges on the condensed consolidated statements of income as a result of the prior hedged transactions being deemed probable of not occurring. Since the economic impact will not be realized until future periods, this amount is excluded from Economic Earnings. For the six months ended June 30, 2017, Economic Earnings excludes an approximately $0.3 million pre-tax charge incurred related to an impairment charge due to a reduction in the expected cash flows to be received from a solar generating facility, for which the economic impact will not be realized until a future period. An impairment charge was also recorded in 2012 within Income from Continuing Operations on a separate solar generating facility which reduced its depreciable basis and recurring depreciation expense, and this was also excluded from Economic Earnings. Economic Earnings is a significant performance metric used by our management to indicate the amount and timing of income from continuing operations that we expect to earn after taking into account the impact of derivative instruments on the related transactions, those transactions or contractual arrangements where the true economic impact will be realized primarily in a future period or was realized in a previous period, and other events that management believes make period to period comparisons of SJI's operations difficult or potentially confusing. Specifically regarding derivatives, we believe that this financial measure indicates to investors the profitability of the entire derivative-related transaction and not just the portion that is subject to mark-to-market valuation under GAAP. We believe that considering only the change in market value on the derivative side of the transaction can produce a false sense as to the ultimate profitability of the total transaction as no change in value is reflected for the non-derivative portion of the transaction. (A) Unrealized mark-to-market gains (losses) on derivatives for the wholesale commodity marketing business were ($9.8) million and ($7.2) million for the three months ended June 30, 2018 and 2017, respectively, and $19.0 million and $8.0 million for the six months ended June 30, 2018 and 2017, respectively. For the retail gas and electric commodity marketing business, unrealized mark-to-market gains (losses) on derivatives were $3.5 million and ($1.0) million for the three months ended June 30, 2018 and 2017, respectively, and $(1.8) million and $(1.7) million for the six months ended June 30, 2018 and 2017, respectively. For Energy Services, all unrealized mark-to-market losses on derivatives pertain to our CHP business. (B) Represents impairment charges taken at our solar business on solar generating facilities in 2018, which was primarily driven by the purchase price in the agreement to sell solar assets being less than the carrying amount of the assets, and in 2017, which was primarily driven by declining market conditions at that time, specifically market prices of solar renewable energy credits (SRECs). (C) Represents net losses taken at our wholesale commodity marketing business, including interest, legal fees, and the realized difference in the market value of the commodity (including financial hedges), resulting from a ruling in a legal proceeding related to a pricing dispute between SJI and a gas supplier that began in October 2014. Also represents, for the six months ended June 30, 2017, a charge, including legal fees, resulting from a settlement with a counterparty over a dispute related to a three-year capacity management contract. Since the net losses relate to purchase transactions that primarily occurred in prior periods, these amounts are excluded from Economic Earnings. 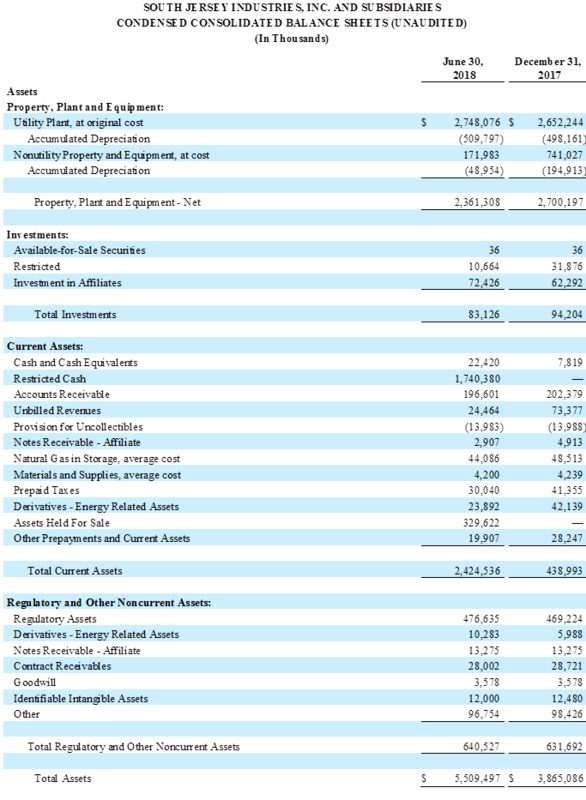 (D) Represents costs incurred in connection with the acquisition of the assets of Elizabethtown Gas and Elkton Gas. Also represents costs incurred to enter into series of agreements whereby Marina will sell its portfolio of solar energy assets to a third-party buyer. (E) Included in this amount are amendments made to an existing interest rate derivative linked to unrealized losses previously recorded in AOCL. SJI reclassified this amount from AOCL to Interest Charges on the condensed consolidated statements of income as a result of the prior hedged transactions being deemed probable of not occurring. Since the economic impact will not be realized until future periods, this amount is excluded from Economic Earnings. Also included is additional depreciation expense within Economic Earnings on a solar generating facility where an impairment charge was recorded in the past, which reduced the depreciable basis and recurring depreciation expense, and the related reduction in depreciation expense was added back in the prior year. (F) Determined using a combined average statutory tax rate of approximately 25% and 40% for 2018 and 2017, respectively. **Utility Margin is a non-GAAP financial measure and is further defined under the caption "Utility Margin" below.